Government: "We are not yet able to comment on the reason for his detention"
Company: "We are concerned about our people's wellbeing"
HONG KONG, China (CNN) -- The Australian government and Rio Tinto, the world's second largest mining company, are investigating why four of the firm's employees have been detained by Chinese police in Shanghai. 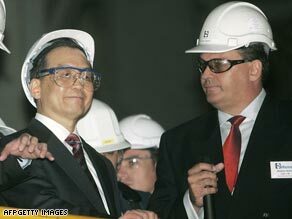 File photo of Chinese Premier Wen Jiabao on a 2006 tour of a Rio Tinto plant in Western Australia. The Australian Department of Foreign Affairs and Trade confirmed that one of the four is an Australian passport holder and that Chinese authorities have confirmed his detention. "We are not yet able to comment on the reason for his detention," a government spokesperson said. The incident comes after Rio Tinto broke away from a $19.2 billion investment deal with state-owned Chinalco last month. Rio Tinto released this statement on the incident: "It appears four employees from our Shanghai office have been detained for questioning by the Chinese authorities in Shanghai. "The reasons for these actions are unclear. We intend to co-operate fully with any investigation the Chinese authorities may wish to undertake and have sought clarification on what has occurred. "We are concerned about our people's wellbeing and are doing everything we can to help them and support their families." Officials from the Shanghai government press office told CNN they couldn't confirm the arrest, nor could the Shanghai Public Security Bureau. The deal with Chinalco was signed in February and was awaiting a review by Australia's Foreign Investment Review Board. The Chinalco-Rio Tinto deal soured as opposition party members ratcheted opposition, claiming it puts Australian resources at strategic risk. Others saw the deal as a strategic alliance that would help further link resource-rich Australia with the commodities-hungry Chinese market.